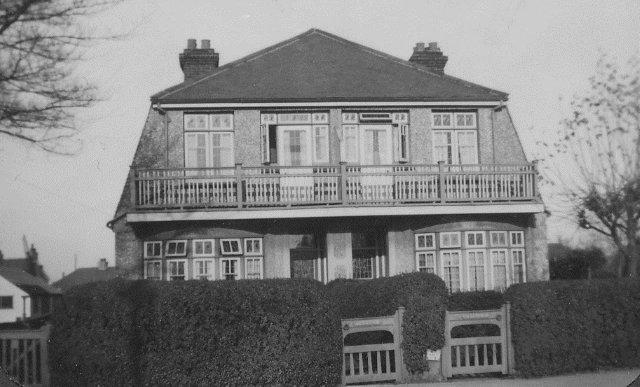 My grandfather, Henry Rayner, lived with his wife Ada, daughters Ada, Florence, Hilda, Ethel and son Henry Cave (my father) at “Inglewood” just outside Hadleigh village from the early 1900s to 1959. Henry died in 1954, daughter Ada in 1958. Subsequently the family moved away. My sister and I were taken to visit our grandparents after the war and have fond memories of the house and long back garden where we used to play. Henry Rayner was a builder and a carpenter par excellence. Before he came to Hadleigh he had a shopfitters business at 43 Artillery Row Spitalfields and worked on the Heritage buildings Nos. 56 and 58 in what has now been renamed Ravens Row. Grandpa was a keen photographer. During our family research we found my father, Henry Cave, at the age of 20, making an appearance in the newspaper when his best mate was killed in a motor cycle accident near Chelmsford. Dad never got over that and hated motorbikes from that day on!! We would really like to hear from anyone who knows the street number of Inglewood as we cannot find the house on google maps. It may well have been renovated or even demolished. We do not know if grandpa built the house. Any information on the Rayner family in their years at Hadleigh will be gratefully received as we now realise how little we knew about our grandparents. Pete, thank you so much. I googled the house but noticed that the site now has dentists, spars etc. Grandpa would have turned in his grave!!!! Have just traced him at the age of 18 living in Pelham House, 30 Spital Square, London. Another missing link. I wonder if he built no.551 as he was a builder/carpenter. P.S. I believe “Inglewood” would have been facing the Salvation Army colony fields, so would have had magnificent views towards the Thames and Kent coast, hence the balconies on the property. Inglewood was/is No 551 London Road, Hadleigh.